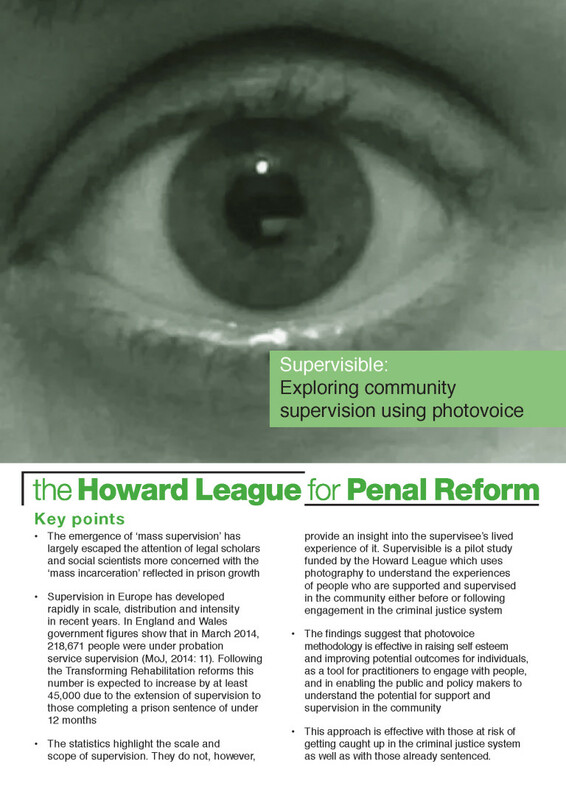 This report, written by Professor Wendy Fitzgibbon, for the Howard League shows how the innovative photovoice methodology was used with a group of women who were undergoing or had experienced community supervision. In recent years, community supervision has developed rapidly in scale, distribution and intensity. However, the emergence of ‘mass supervision’ (i.e. in the community) has largely escaped the attention of legal scholars and social scientists more concerned with the ‘mass incarceration’ reflected in prison growth. This is a gap in the academic analyses of criminal justice. Supervisible aims to begin to bridge this gap. It uses the compelling, and novel, photovoice methodology to understand the perspectives of service users. Participants are invited to take a series of photographs, select specific ones and discuss their choices and motives with the researchers.